After one bite, all you'll be hearing is, "WOW!" These brownies bake up with their own hot fudge sauce. They're like no brownies you've ever tasted...promise! In a large bowl, combine flour, granulated sugar, 2 tablespoons cocoa, the baking powder, and salt. Add milk, oil and vanilla; mix with a spoon until smooth. Stir in walnuts and pour batter into baking pan. In a small bowl, combine brown sugar and remaining 1/4 cup cocoa; sprinkle evenly over batter. Pour hot water over brown sugar and cocoa. Bake 35 to 40 minutes, or until top is cracked and brownies are just firm to the touch. Remove from oven and let cool 15 minutes. Cut into squares and place on individual serving plates. 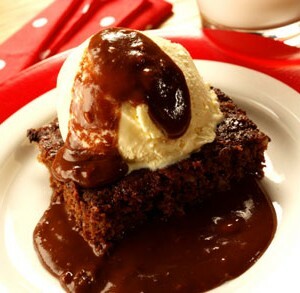 Top each with a scoop of ice cream and fudge sauce from bottom of pan. Serve immediately.